Ceram is pleased to announce that a new technique has been added to their extensive list of analytical techniques - 3D SEM. The SEM (Scanning Electron Microscopy) is used for microstructural analysis, fault diagnosis, imaging and elemental analysis of small areas of solid materials. Whereas previously only two-dimensional SEM images could be obtained, the new technique now enables the production of 3D images. These 3D images provide topographical data including line scans and surface roughness parameters as well as having the capability of being turned into movie clips. 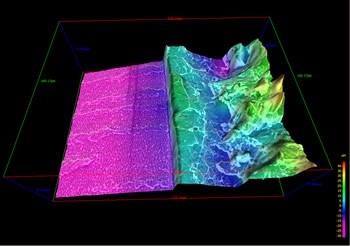 An example 3D SEM image of a metallic-glass interface is shown. The 3D SEM can be utilised on almost any sample type and has excellent resolution when looking at not only flat surface but also sharp edges and non-uniform samples such as bone, fabrics and hair.